Everyone always asks "Who Makes the Best Filter for my Yamaha R1? GSX-R 600? Aprilia RSV4? Kawasaki ZX-6R, Yamaha R3? etc, etc, etc"
Scan the forums and you'll see all sorts of comments and reviews, most by people that have no proof, regurgitating what they heard from their friend, or just saying the popular brand name that advertises the most online. 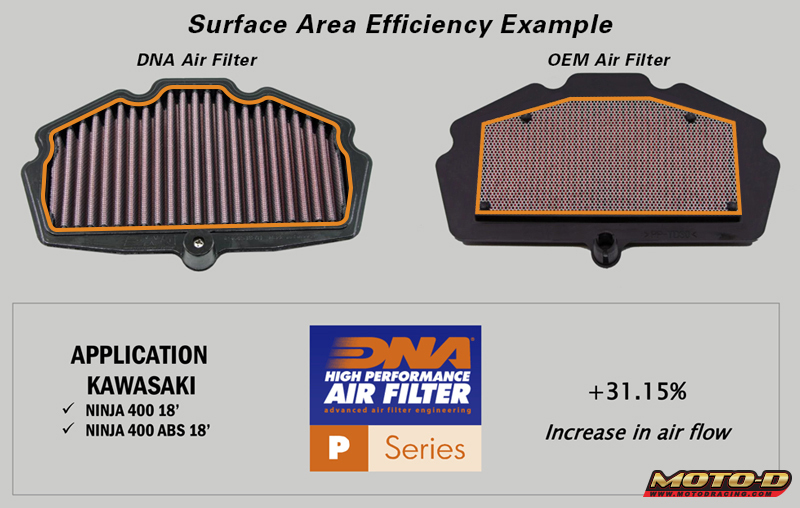 DNA IS THE ONLY MOTORCYCLE AIR FILTER THAT PUBLISHES THEIR PERFORMANCE GAINS - THEY ARE PROUD OF THEIR FCD TECHNOLOGY AND EXTENSIVE R&D. This is why DNA Air Filters are the Best #1 Rated by Race Teams in BSB, WSBK, CIV and in several independent motorcycle magazine tests. 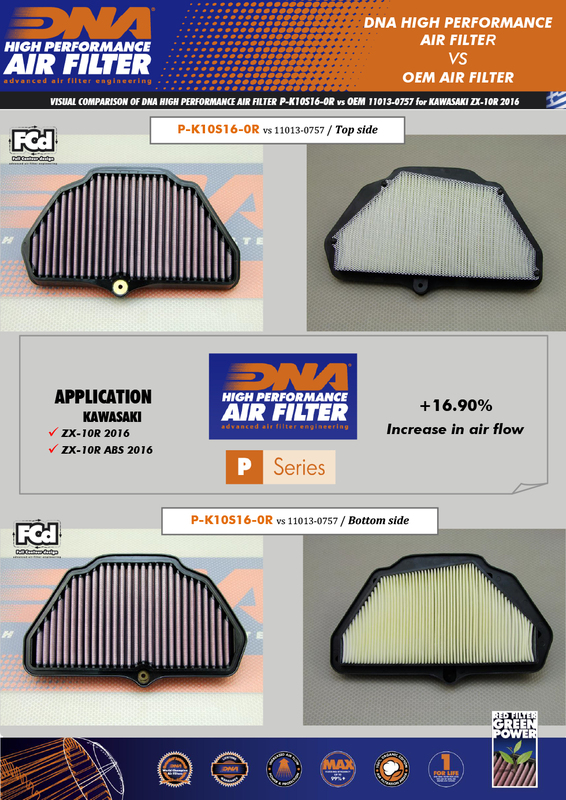 Compared to a cheap stock filter, a World Championship quality DNA Motorcycle Air filter has a much greater intake area. There are 4 layers of DNA Next Generation Premium Cotton passing 98-99% Clean Air with Maximum CFM Flow Rates. 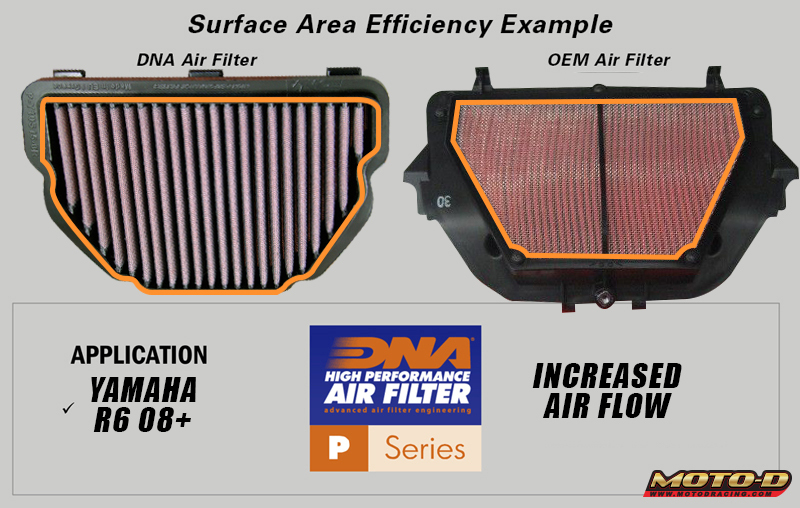 DNA IS THE ONLY MOTORCYCLE AIR FILTER THAT PUBLISHES THEIR PERFORMANCE GAINS - THEY ARE PROUD OF THEIR FCD TECHNOLOGY AND EXTENSIVE R&D. 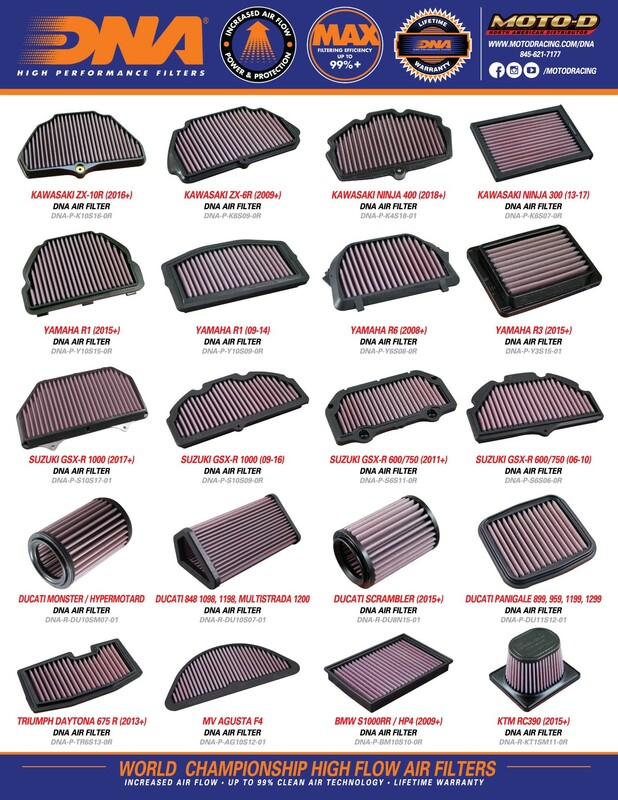 DNA Manufactures Race Quality Air Filters for popular Sportbikes invcluding Aprilia RSV4, Kawasaki Ninja ZX-10R, Ducati Panigale, Honda CBR 600RR, Yamaha R6, Yamaha MT-09, KTM RC390, and Triumph 675.